How awesome does THIS sound!? Well, it tastes even more awesome. You can bake one of these bad boys and have food for the whole week, or serve it at a dinner party. Either way, you wont be disappointed. 1) Preheat your oven to 375°F. Bring a large, wide pot of water to boil with salt and a splash of oil, that will help keep your noodles from sticking together as they drain. 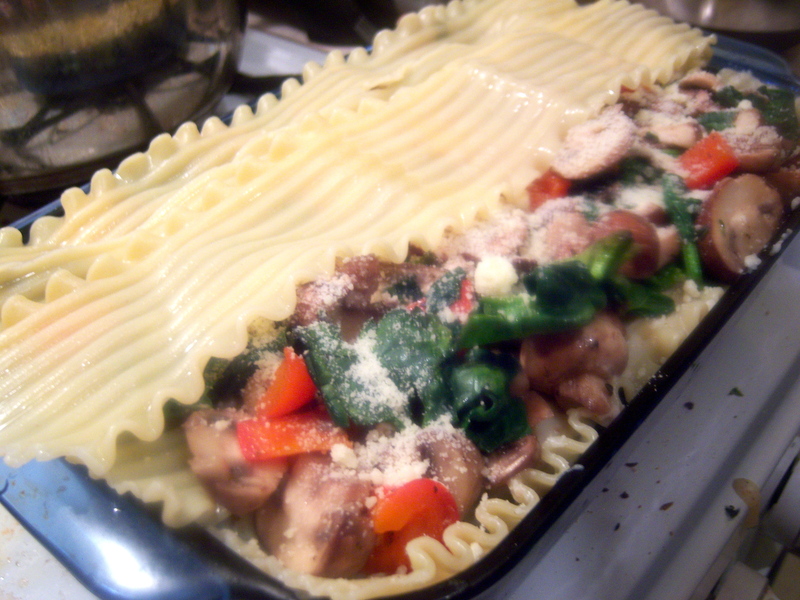 Add the lasagna noodles and cook for 10 minutes. Drain and set aside. 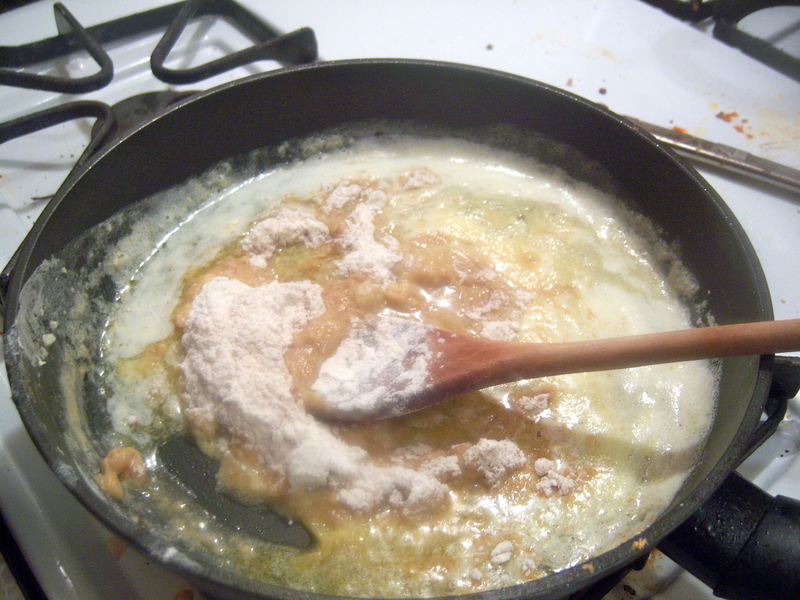 2) Make béchamel: Bring the milk and garlic to simmer in a saucepan, or heat it in your microwave, and set it aside. 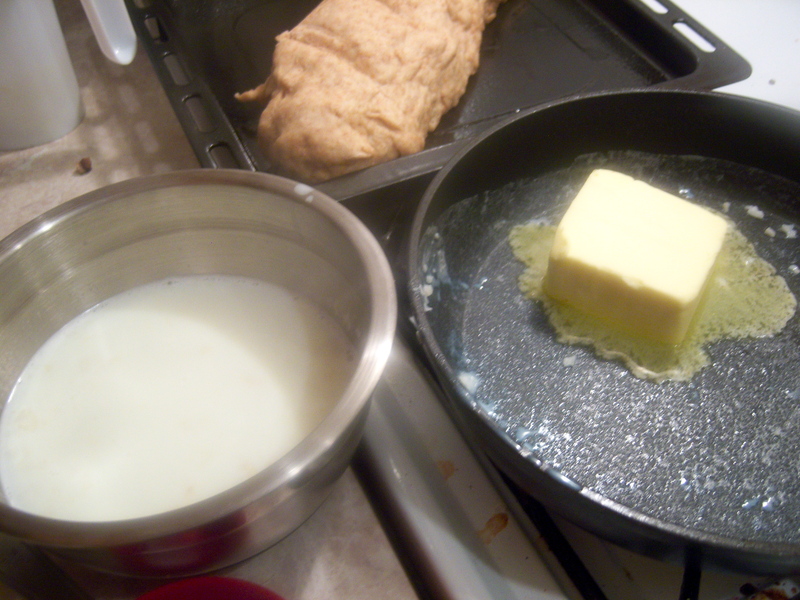 Melt 1/2 cup (8 tablespoons or 1 stick) butter in a large saucepan. Add the flour and cook for one minute over lowheat, stirringconstantly with a whisk or wooden spoon. Pour in the hot milk, a little at a time at first and stirring until combined. Once you’ve added half of it, you can add the second half all at once, along with 1 1/2 teaspoons table salt, the pepper, and nutmeg. 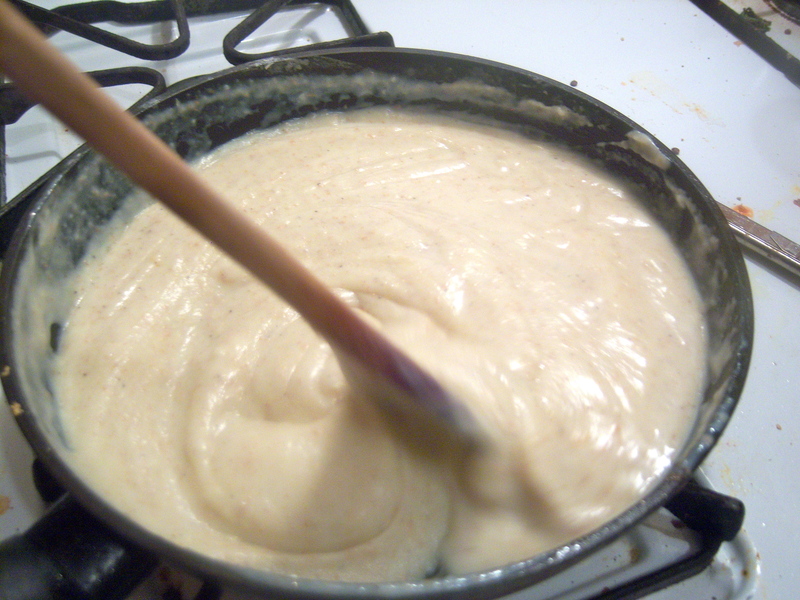 Cook over medium-low heat, stirringor whisking frequently, for 3 to 5 minutes, or until thick. Set aside. 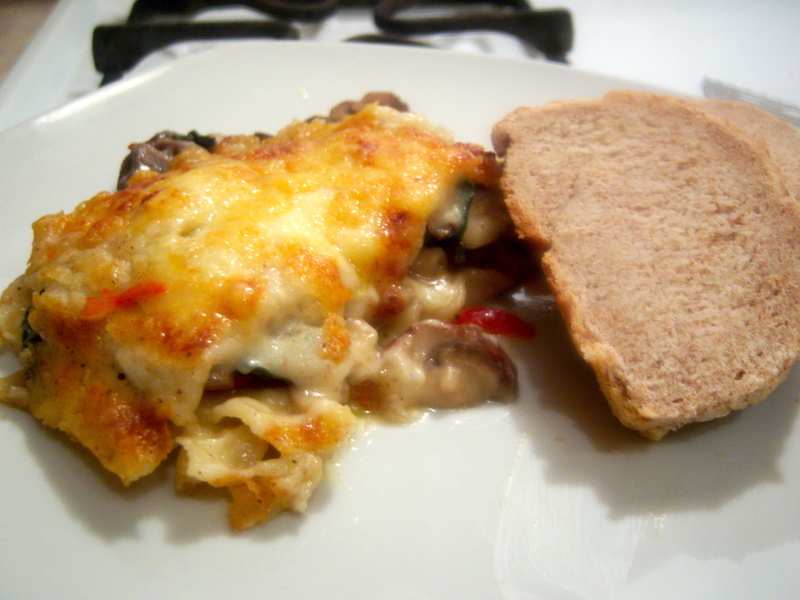 3) Prepare vegetables: Discard portobello mushroom stems and/or trim the ends of the cremini stems. Slice mushrooms 1/4-inch thick. Cube red peppers and chop spinach. Heat 2 tablespoons olive oil and 2 tablespoons butter in a large sauté pan. Cook half the mushrooms and red peppers with a couple pinches of salt for about 5 minutes, or until they are tender and release some of their juices, tossing to make sure they cookevenly. Add the spinach during the last minute or so of cooking, remove from fire when the spinach wilts. If your pot isn’t big enough, repeat with additional oil and butter, and remaining vegetables. 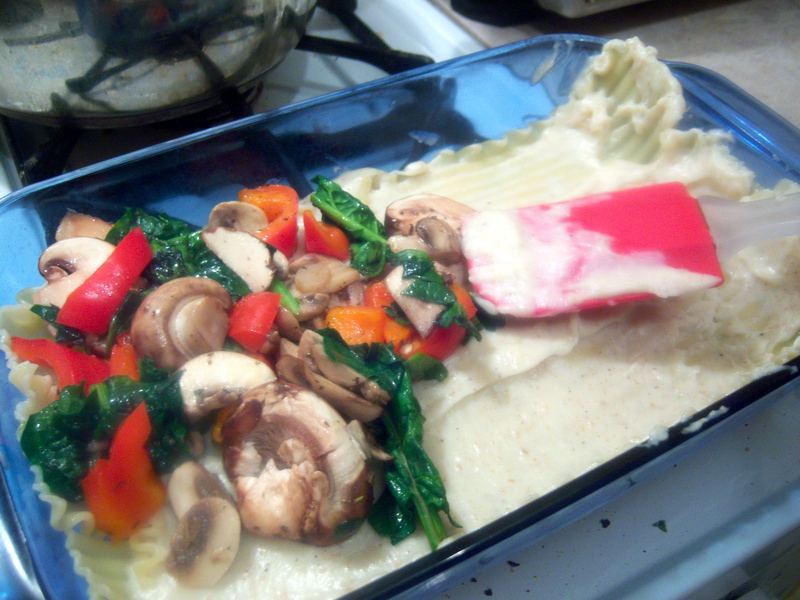 Bake for 45 minutes, or until top is browned and the sauce is bubbly. Let sit at room temperature for 15 minutes before serving. To freeze for future use, allow it to cool completely and wrap two to three times in plastic wrap before freezing. Serve with a baguette or a fresh salad. Or both.